Who Wacked Roger Rabbit? – book review by Fred Patten. 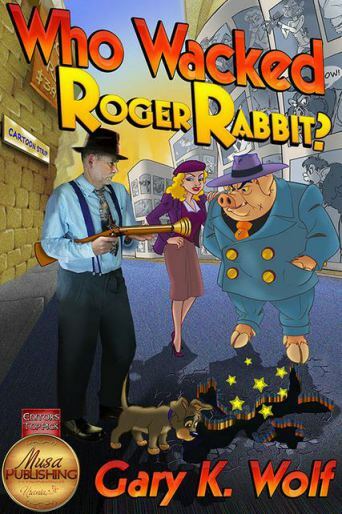 Who Wacked Roger Rabbit?, by Gary K. Wolf. Colorado Springs, CO, Musa Publishing, December 2014, trade paperback $14.00 (306 pages). This is the third “Roger Rabbit” novel by Gary K. Wolf in 30+ years. The first, Who Censored Roger Rabbit? (St. Martin’s Press, October 1981), was bought by Walt Disney Productions and turned into the considerably different animated feature Who Framed Roger Rabbit (June 1988). (For example, there is no Toontown; Roger talks through speech balloons; does not spray his P’s; and he is killed in the novel.) The movie was a mega-hit, and Wolf wrote a second novel, Who P-P-P-Plugged Roger Rabbit (Villiard Books, August 1991) that was not as much a sequel as a movie media tie-in. The title emphasized Roger’s distinctive stutter from the movie, and the dust jacket showed Roger and his wife Jessica as they appear in the Disney cartoon design in the movie. But the second novel’s new background was not that of either the first novel nor of the movie. Now Wolf has written a third novel. Who Wacked Roger Rabbit? seems betwixt & between the first two. The date is 1947 or ’48, when “Walter Windchill” and “Luella Parslips” are still active gossip columnists. Columbia is about to make a new movie starring Gary Cooper, but a deliberate change from his usual Westerns and sophisticated roles. Producer Barney Sands (a human) explains to Eddie that it’s to be set in Toontown, with Coop playing a low-class human living there.